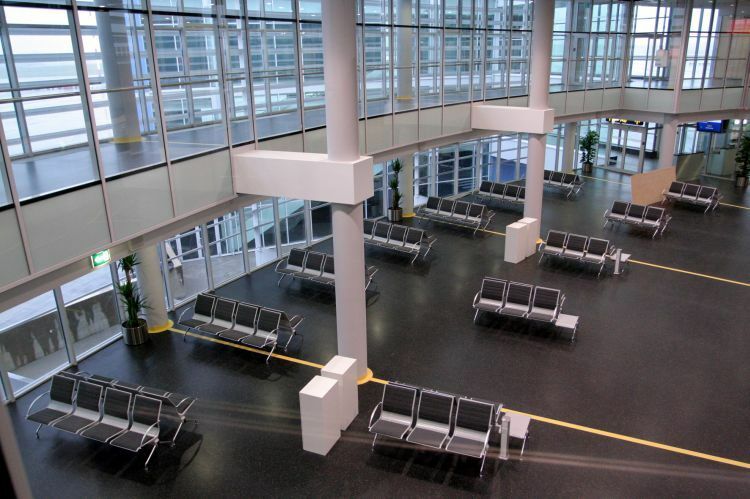 Construction of a new passenger terminal has been completed at the InternationalVilniusAirport. The new terminal has three floors and occupies the area of 17 thousand sq . m. Various special services (the State Border Guard Service, customs, veterinary and plant quarantine offices, police) as well as a hall for transit passengers will be located on the first floor of the terminal. The second floor is intended for departing passengers. Having gone through checks in different flows (which will separate the already mentioned Schengen and non-Schengen passengers), they will enter separate “sterile zones”, which will lead them to aircrafts through six (four of them being newly constructed) extensible loading bridges. The third floor is intended for arriving passengers. Moreover, the third floor will host a business club and a VIP hall. The second and third floors of the new terminal will house duty-free shops.